The SuperOcean Héritage is a sporty, classic diving watch reminiscent of Breitling's first SuperOcean from the 1950s. The Héritage collection offers both three-hand models as well as chronographs. The SuperOcean Héritage is an homage to the beginnings of Breitling's diving watch line. In 1957, the luxury watch manufacturer introduced the SuperOcean. It was originally targeted toward professional divers, seeing as recreational diving was not yet a widespread hobby. 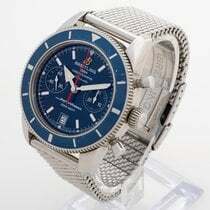 In 2007, Breitling launched the SuperOcean Héritage as its own independent series in honor of the first Breitling diving watches from 50 years previously. The Héritage is oriented towards its historical predecessor, but it's not an exact replica. Its timeless, retro design is a new interpretation of the older watches. 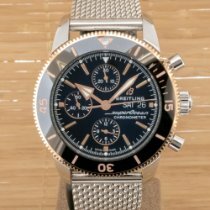 Initially only available with a diameter of 38 mm, Breitling followed the trend toward larger watches and began offering versions with 42 and 46 mm diameters. The most important feature of a diving watch is its water resistance. The SuperOcean Héritage is water resistant to 200 m (20 bar, 656 ft). However, that's nothing compared to the Avenger II Seawolf, which is water resistant to an impressive 3,000 m (300 bar, 9,843 ft) and features a helium escape valve. A screw-down crown and a unidirectional bezel are the common markers of a diving watch, both of which the SuperOcean Héritage has. The bezel has a 120-tooth system and only turns counterclockwise; this makes it impossible to accidentally increase the dive time. It also has a triangle as the zero marker as well as 11 lines dividing the hour into five-minute increments. 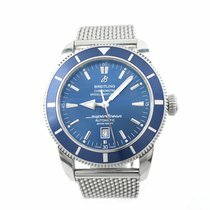 How much does a Breitling SuperOcean Héritage cost? Even though its retro look may suggest otherwise, the SuperOcean Héritage is actually a young collection with plenty of models to choose from. For example, if you prefer smaller watches, the Héritage 38 will probably tickle your fancy. As its name suggests, this watch has a 38-mm case, making perfect for both men and women. The caliber B37, based on the ETA 2895-2, gives this watch its date display at 3 o'clock and small seconds dial at 6. In terms of color, you have the choice between black, blue, or brown. This timepiece is worn on a Milanese steel bracelet or a rubber strap. 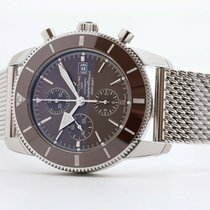 While this watch is no longer a part of Breitling's current catalog, you can find unworn models on Chrono24 for around 2,800 USD and pre-owned models in good condition for about 2,600 USD. If you're looking for a larger watch, you may enjoy the Héritage 42 or 46. At 42 and 46 mm, they are much larger than their smaller sister model, though you will have to make do without a small seconds dial. In addition to the color options of the smaller version, these larger pieces also come in combinations with a white dial and black bezel or a black dial with a green bezel. Depending on its condition, plan to spend between 3,100 and 3,500 USD for a Héritage 42. Prices for the larger, 46-mm variant start around 3,200 USD. Like the Héritage 38, neither of these models is part of Breitling's current collection. 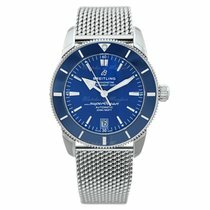 In 2017, Breitling introduced a revamped version of this retro watch: the SuperOcean Héritage II. The appearance of these three-hand watches remains largely unchanged from that of their predecessors. Only the bezel has been changed and outfitted with a high-tech ceramic inlay. The real changes took place on the inside of the watch. It is now powered by the caliber B20, based on the Tudor caliber MT 5612. Plan to spend around 4,200 USD for a 42-mm Héritage II. The 46-mm model costs between 3,500 and 4,100 USD depending on its condition. 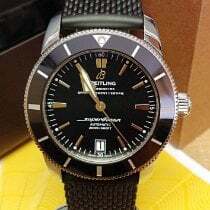 Breitling has also offered a 44-mm version of the Héritage II since early 2018. Other than its dimensions, this watch is no different from the other models in the collection. You will need to have about 5,000 USD on hand to buy a Héritage II 44 in mint condition. Both the Héritage and the Héritage II are available with chronograph functions. The older models come in two sizes, 44 or 46 mm, and are easy to spot by the layout of their subdials. Smaller models have a bi-compax layout with a minute counter at 3, a small seconds dial at 9, and a date display at 6 o'clock. They are outfitted with the caliber B23 (Valjoux 7753), which has a 42-hour power reserve. Prices for these timepieces sit around 4,800 USD. The Valjoux 7750-based caliber B13 is found in the larger models. Its date display is located at 3 o'clock, while the hour, minute, and second counters can be found at 6, 9, and 12 o'clock, respectively. Never-worn models start around 4,300 USD. Pre-owned pieces cost about 500 USD less. Upon its release in 2017, the Héritage II line only featured 46-mm chronographs. The Swiss manufacturer from Grenchen also equipped these watches with the B13 caliber and offered them in blue, black, or brown with a matching ceramic bezel inlay. Be prepared to spend about 5,100 USD for one of these models. Breitling announced two updates to the Héritage II Chronograph shortly before Baselworld 2018. While both models are 44 mm in diameter, their movements are what helps distinguish them from each other. The standard edition still uses the caliber B13, which has been upgraded to include a day display in addition to the date, and costs around 7,100 USD. The in-house Breitling caliber B01 serves as the beating heart of the second version and has an impressive 70-hour power reserve. It has a stop seconds dial at 3, an hour counter at 9, a small seconds dial at 6, and a date display between 4 and 5 o'clock. The subdials and dial contrast nicely with one another and come in the following combinations: white subdials on a black or blue dial or black subdials on a white dial. To call one of these watches your own, you will need to invest around 8,600 USD. If you prefer something even more exclusive, you should take a closer look at the SuperOcean Chronoworks with a limited run of 100 pieces. It also features the in-house B01 caliber; however, its 46-mm case is made of black high-tech ceramic. You will need almost 44,000 USD to put one of these rare timepieces on your wrist. The Breitling 17 automatic movement powers the three-hand Superocean Héritage. It comes in both the 42-mm as well as a 46-mm models and has a date display. The caliber has a power reserve of 40 hours and is based on the tried-and-true ETA 2824-2 caliber. It vibrates at a frequency of 28,800 alternations per hour. The automatic caliber Breitling 23 powers the original Héritage Chronograph 44. This movement is based on the Valjoux 7753. Its stopwatch function times up to 30 minutes, keeping track of the minutes on a subdial at 3 o'clock. The small seconds subdial is located at 9 o'clock. The Breitling 23 has a power reserve of at least 42 hours. Unlike the Chronograph 44 with its bi-compax layout, the larger Héritage Chronograph 46 has a third subdial. The hour counter at 6 o'clock times up to 12 hours. The minute counter is located at 12 o'clock, while the small seconds is located at 9 o'clock. The date display is located at 3 o'clock. The timepiece is powered by the Breitling 13 movement, which is based on the famous Valjoux 7750 movement from ETA. Like the Breitling 23, the Breitling 13 has a 42-hour power reserve. The smaller Héritage 38 model features the Breitling 37 caliber, which is based on another ETA movement, the 2895-2. It includes a 42-hour power reserve and a small seconds dial at 6 o'clock. Breitling chose their in-house Breitling 01 caliber to power the Héritage II B01 chronograph, which they introduced in 2018. This same movement can also be found in the Navitimer. It has a 70-hour power reserve and can measure time in increments of ¼ of a second. Another version, the B01C, was developed specifically for the limited edition SuperOcean Chronoworks and boasts a remarkable 100-hour power reserve. The caliber B20 also made its debut in the SuperOcean Héritage II collection. It vibrates at 28,800 alternations per hours and has a 70-hour power reserve. This movement is based on the Tudor MT 5612 in-house caliber. In 2016, Breitling and the Rolex daughter company came to the agreement that Tudor was allowed to outfit their watches with Breitling chronograph calibers and in return, Breitling was permitted to use Tudor calibers in theirs.